Routine blood cultures are commonly taken in patients who present to the Emergency Department (ED) with suspicion of infection. This is also in conjunction with treatment guidelines for severe community-acquired pneumonia, acute meningitis and bacteraemia, etc. The above practice has become a major area of resource utilisation, despite many studies showing poor yield of these cultures. The poor yield of blood cultures is financially costly for patients, and even more so for hospitals. Hidden costs such as wastage of resources, additional working hours for healthcare staff and increased needle stick injuries are a huge burden to hospitals. In addition, contamination (or false-positive blood culture results) has been shown to lead to increased length of stay and total hospital charges. This review questions the efficacy of routine blood cultures taken in the emergency department, in the context of community-acquired pneumonia, cellulitis, urinary tract infection and pyelonephritis. The results of the review showed that blood cultures for community acquired pneumonia, simple and complicated cellulitis as well as simple acute urinary tract infections are not recommended as they do not hold much significant clinical impact on the antibiotic regimen and there is no need for them to be taken prior to the administration of antibiotics. Blood cultures should be taken in patients with severe signs of systemic infection, hospital-acquired pneumonia, complicated cellulitis and pyelonephritis because it is possible for blood cultures to have a bearing on the clinical management. Routine blood cultures are commonly taken in patients who present to the Emergency Department (ED) with suspicion of infection. This is also in conjunction with treatment guidelines for severe community-acquired pneumonia , acute meningitis [2,3] and bacteraemia , etc. The above practice has become a major area of resource utilisation, despite many studies showing poor yield of these cultures. A study in a United States Hospital Emergency Department between 2001 to 2004 revealed an increasing trend for blood culture usage . The poor yield of blood cultures is financially costly for patients, and even more so for hospitals. Hidden costs such as wastage of resources, additional working hours for healthcare staff and potential needle stick injuries are a huge burden to hospitals. In addition, contamination (or false-positive blood culture results) has been shown to lead to increased length of stay and total hospital charges [5,6]. Blood cultures results also rarely warrant a change in antibiotic management plans as empirical antibiotic therapy covers for most of the common pathogens [4,6-9]. Waiting for blood culture results before starting antibiotics is not encouraged, since it might delay prompt treatment, early goal directed therapy and even affect mortality and morbidity in some cases. Doing blood cultures before commencing antibiotics remains an area of significant debate and the evidence to support this still remains not definitive. Another consideration is also guidelines evolve and change. For example, The Joint Commission on Accreditation of Healthcare Organisations (JCAHO) and Centres for Medicare and Medicaid Services quality measures for pneumonia that emphasize performing blood cultures before administering antibiotics and maximising the number of subjects receiving the latter within 4 hours of ED arrival, is quite different from today's practice [10-12]. To identify relevant articles, we searched PubMed using the search string "Emergency Department" AND "Blood Culture" AND "Pneumonia", ""Emergency Department" AND "Blood Culture" AND "cellulitis" and "Emergency Department" AND "Blood Culture" AND "pyelonephritis". The references of the relevant publications found were also reviewed as part of our literature search. The time frame for article selection was limited to the most recent 15 years (i.e. from 2003 to current). We focused mainly on articles that discussed the effectiveness of blood cultures in an emergency department setting, specifically towards community-acquired pneumonia, urinary tract infections, pyelonephritis and cellulitis. From the articles reviewed, we examined the percentage of positive blood cultures obtained, compared the true-positive rates among various papers, analysed the consequences of false-positive results (contaminants), whether antibiotic regimens were changed because of blood cultures results and consolidated the conclusions from various authors on the recommendations of the value and clinical significance of the use of blood cultures. Pneumonia is a condition very commonly seen in the Emergency Department in Singapore. In 2015, Pneumonia was ranked second (19.4%) for the principal causes of death, one behind cancer (29.7%) . Community-acquired pneumonia (CAP) is defined as pneumonia acquired outside of hospital settings and can be distinguished from Hospital-Acquired Pneumonia (HAP), usually by its causative pathogens - Streptococcus pneumoniae, Haemophilus influenzae and Moraxella catarrhalis. The diagnosis is usually made by clinical features and via lung imaging - commonly a chest radiograph. Selected diagnostic laboratory testing, such as sputum and blood cultures, is only indicated for in patients with severe illness as there is a higher chance that pathogens not covered by empiric therapy will be found and hence influence antibiotic regimens . A study by Makam, et al. looked at the trend of blood cultures collected in patients with CAP and found a relative increase of 73.4% in 2002 and 2010, whereas cultures obtained for urinary tract infection remained relatively stable . One reason provided for the increase follows from the mandate by JCAHO and The Centres for Medicare and Medicaid guidelines on quality measures that emphasized performing blood cultures before administering antibiotics in the ED [10,11]. This prompted doctors to reflexively order cultures for patients with CAP for whom antibiotics are expected. Makam, et al. concluded that appropriate blood cultures use should be reserved only for the sickest patients when the results could reduce harm, limit hospital stay and lower costs . Other literature suggest that blood cultures rarely altered the management of CAP. Ramanujam, et al. in 2006 revealed positive blood cultures for bacteraemia in 4.5% of the patients with 1.3% warranting a change in antibiotic regimen because of deterioration of clinical status and not due to blood culture results . This is similar to another article in 2007 where a true positive rate of 3.4% was found and for the 0.7% that required a change in antibiotic therapy, none of them had antibiotics coverage broadened due to a resistant organism . These authors recommend eliminating blood cultures for CAP, but still obtaining blood cultures for patients at risk of hospital-acquired pneumonia, since the blood cultures taken rarely altered therapy for patients presenting to the ED with pneumonia [9,10]. Another 2005 study by Kennedy, et al. found 7.0% true positives of which 11 patients had antibiotic coverage narrowed and 4 had theirs broadened due to resistance to empirical therapy . Abe, et al. in 2009 showed that 3.7% of the study population had been found positive for bacteraemia, out of whom 2 had their coverage narrowed and 1 had theirs broadened . The blood cultures taken could only identify microbes in a small percentage of people with pneumonia and since few patients altered therapy, it may not be necessary to obtain blood cultures for most patients. Significant healthcare cost was incurred for this practice of taking blood cultures which could possibly have been reduced with proper decision on blood cultures usage. From the above literature, blood cultures appear to be of low value and are not recommended for use with community-acquired pneumonia prior to antibiotics management [8,9,13-15]. Cellulitis is a skin and soft tissue infection that may involve warmth, swelling, tenderness, and erythema of the affected area, commonly caused by streptococci of various groups and less commonly by Staphylococcus aureus . It is estimated to affect 16.4-24.6 per 1000 person-years in developed countries. Typically, uncomplicated cellulitis is treated with an antimicrobial agent that is active against streptococci, while systemic antibiotics are indicated for cellulitis with systemic involvement . On the other hand, guidelines for treating patients with complicated cellulitis differ. Complicated cellulitis can be defined by the presence of any of the following: patients with malignancy on chemotherapy, neutropenia, severe cell-mediated immunodeficiency, organ transplantation, and diabetes, to list a few. In these patients, broad spectrum antibiotics have to be considered [17-20]. Despite the differences in treatment, available studies appear to discourage the use of blood cultures in the both uncomplicated and complicated cellulitis. In a 2005 study by Mills, only 11 (2%) out of 553 blood cultures were positive for bacteraemia in a cohort of 757 immunocompetent adult patients admitted for community-acquired cellulitis . Out of the 11, 8 of these allowed for change of empiric treatment from cefazolin to penicillin, while the remaining patients receiving empiric therapy required no change. In another study, Coburn suggested that blood cultures should not be ordered for adult patients without considering the pre-test probability of bacteraemia, while noting that the pre-test probability of bacteraemia in cellulitis was as low as 2% . Similarly, in the paediatrics population, a study by Malone involving 580 patients younger than 18-years-old admitted for skin and soft tissue infections showed that no positive blood cultures were detected in 445 blood cultures obtained among the 482 patients with uncomplicated skin and soft tissue infections . On the other hand, 10 (12.5%) blood cultures were positive from the 80 blood cultures obtained out of the remaining 98 in the complicated skin and soft tissue infections group. This suggests that in uncomplicated cellulitis, blood cultures were of low yield, did not significantly alter treatment and were generally not useful in evaluating immunocompetent patients. Paolo, et al. in 2013 compared the yield of blood cultures in complicated versus uncomplicated cellulitis . He applied the definition of complicated cellulitis to patients with active chemotherapy, dialysis, immunocompromised states, diabetes, or organ transplantation, versus a cohort of individuals without medical comorbidity. 29 (9.2%) out of 314 were positive blood cultures for complicated cellulitis while 17 (5.2%) out of 325 were positive blood cultures for uncomplicated cellulitis. There was a change in management in 6 (1.9%) out of 314 cases of complicated cellulitis versus 4 (1.2%) out of 325 controls. The author concluded that only 2% of all cultures returned useful information for changing empiric management; while there was higher yield of blood cultures in the complicated group, the results rarely changed empirical coverage for complicated cellulitis. These results were similar to that of Malone's in 2013, which found that the yield of cultures in complicated cellulitis was higher compared to that of cultures in uncomplicated cellulitis . Interestingly, Tay, et al. in 2014 found that 23 (10.8%) out of 214 blood cultures taken were true-positives . While there was no difference in mortality rates between patients with and without bacteraemia, the former had significantly longer stayed and were at higher risk of recurrence. Even though most pathogens in bacteraemia were gram-positive cocci and positive cultures usually did not affect antibiotic choice, bacteraemia in cellulitis appeared to be a prognostic factor for increased length of stay and recurrence of cellulitis. Identifying these individuals by blood cultures can be beneficial as they require more aggressive intervention to prevent recurrence, closer follow up, and might be potential candidates for prophylactic antibiotics [16-18]. Hence, blood cultures should be performed for patients with cellulitis who have factors predicting risk of bacteraemia, such as presence of the lymphoedema, leukocytosis, liver cirrhosis, chronic kidney disease, immunosuppression and ipsilateral orthopaedic device implantation [24-27]. The above findings suggest that blood cultures are of low value and are not recommended for use with uncomplicated cellulitis in immunocompetent patients. On the other hand, the usefulness of blood cultures in complicated cellulitis remains as an area for future studies to look into. Urinary tract infection (UTI) is an infection in any part of the urinary system - kidneys, ureters, bladder and urethra - affecting 150 million people each year worldwide [28-30]. Infections can be termed upper or lower tract depending on their occurrence; commonly, upper tract infections involve the kidneys and are termed pyelonephritis, while lower tract infections involve the bladder and are known as cystitis. UTIs are almost always caused by bacteria, although some viruses, fungi, and parasites can infect the urinary tract as well. Bacterial infections of the urinary tract are very common, especially in young, sexually active women and are usually caused by Escherichia coli, Proteus mirabilis, Klebsiella pneumoniae and Staphylococcus saprophyticus . UTIs are a significant cause of morbidity in infant boys, older men and females of all ages, and is ranked 9 among the top 10 principal causes of death in Singapore in 2015 . Serious complications include frequent recurrences, pyelonephritis with sepsis, renal damage in young children, preterm birth and complications caused by frequent antimicrobial use, such as high-level antibiotic resistance and Clostridium difficile colitis . For management of UTIs, blood cultures are usually not done as a first-line investigation, unlike urinalysis. Blood cultures are only done if the patient presents with fever or other signs of a serious infection to check for bacteraemia or other possible differentials [31-34]. However, up to 30% of women with acute pyelonephritis may have secondary bacteraemia, and identification of the organism by blood culture can be helpful in some cases where antibiotics are started in advance of the urine culture [29,32,35,36]. A study in 2006 examining the clinical impact of bacteraemia in complicated acute pyelonephritis found that 42% of the study population were bacteraemia; this was taken to be a useful indicator of severe disease and was factored into patient management . The study recommended that blood culture samples should be taken in patients with complicated acute pyelonephritis . This is similar to Kim, et al. in 2017 which shows a true positive rate of 42.7% in patients with community-acquired acute pyelonephritis of which 15.8% involved a change in antibiotic regimen . Testing positive for bacteraemia was also a significant predictor of hospital mortality and hence, blood cultures were clinically useful for diagnosis of community-acquired acute pyelonephritis [33,35,36]. However, another study done in 2015 for acute pyelonephritis showed that less than 2% of all pyelonephritis treated at the ED during the study period benefitted from the blood cultures, indicating no significant therapeutic impact of blood cultures before any antibiotic exposure . It was mentioned that blood cultures added little information to urine cultures, which played a bigger role in pyelonephritis . Gomi, et al. in 2011 showed no supporting evidence on whether routine blood cultures improved outcomes in the management of pyelonephritis in pregnant patients. Furthermore, if blood cultures could be excluded without compromising quality of care, there could be significant cost savings made . From the above literature, blood cultures can be used in serious cases of complicated UTIs, but not routinely for simple UTIs and are not recommended for use with UTIs prior to antibiotics management [36-39]. In conclusion, blood cultures for CAP, simple and complicated cellulitis as well as simple acute UTIs are not recommended as they do not hold much significant clinical impact on the antibiotic regimen and there is no need for them to be taken prior to the administration of antibiotics. Blood cultures should be taken in patients with severe signs of systemic infection, hospital-acquired pneumonia, complicated cellulitis and pyelonephritis because it is possible for blood cultures to have a bearing on the clinical management, antibiotics-wise. Also, being tested positive for bacteraemia from the use of blood cultures can be a good predictive factor for prognosis and length of stay in the hospital. If unnecessary blood cultures can be avoided, significant costs and resources can be saved [40-42]. Watkins RR, Lemonovich TL (2011) Diagnosis and management of community-acquired pneumonia in adults. Mortality 83: 1299-1306. Brouwer MC, Tunkel AR, van de Beek D (2010) Epidemiology, diagnosis, and antimicrobial treatment of acute bacterial meningitis. Clin Microbiol Rev 23: 467-492. Lambert M (2011) IDSA guidelines on the treatment of MRSA infections in adults and children. American Family Physician 84: 455-463. McCaig LF, McDonald LC, Cohen AL, Kuehnert MJ (2007) Increasing blood culture use at US hospital emergency department visits, 2001 to 2004. Ann Emerg Med 50: 42-48. Bates DW, Goldman L, Lee TH (1991) Contaminant blood cultures and resource utilization: The true consequences of false-positive results. JAMA 265: 365-369. Alahmadi YM, Aldeyab MA, McElnay JC, Scott MG, Darwish Elhajji FW, et al. (2011) Clinical and economic impact of contaminated blood cultures within the hospital setting. J Hosp Infect 77: 233-236. (2016) Principal causes of death. Singapore Health Facts. 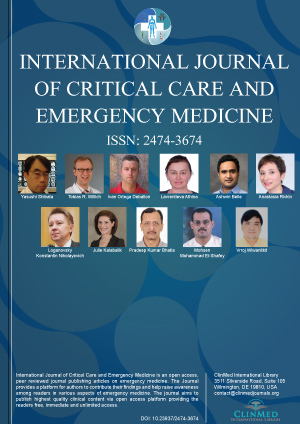 Makam AN, Auerbach AD, Steinman MA (2014) Blood culture use in the emergency department in patients hospitalized for community-acquired pneumonia. JAMA Intern Med 174: 803-806. Ramanujam P, Rathlev NK (2006) Blood cultures do not change management in hospitalized patients with community-acquired pneumonia. Acad Emerg Med 13: 740-745. Joint Commission on Accreditation of healthcare Organisations. Specification manual for national implementation of hospital core measures. Centres for Medicare and Medicaid Services. Hospital Quality Alliance. Hospital Quality measures, 2004-2007. Benenson RS, Kepner AM, Pyle DN, Cavanaugh S (2007) Selective use of blood cultures in emergency department pneumonia patients. J Emerg Med 33: 1-8. Kennedy M, Bates DW, Wright SB, Ruiz R, Wolfe RE, et al. (2005) Do emergency department blood cultures change practice in patients with pneumonia? Ann Emerg Med 46: 393-400. Abe T, Tokuda Y, Ishimatsu S, Birrer RB (2009) Usefulness of initial blood cultures in patients admitted with pneumonia from an emergency department in Japan. J Infect Chemother 15: 180-186. Corbo J, Friedman B, Bijur P, Gallagher EJ (2004) Limited usefulness of initial blood cultures in community acquired pneumonia. Emerg Med J 21: 446-448. Hirschmann JV, Raugi GJ (2012) Lower limb cellulitis and its mimics: Part I. Lower limb cellulitis. J Am Acad Dermatol 67: 163.e1-163.e12. Tay EY, Thirumoorthy T, Pang SM, Lee HY (2014) Clinical outcomes of bacteraemia in cellulitis of the leg. Clin Exp Dermatol 39: 683-688. Stevens DL, Bisno AL, Chambers HF, Dellinger EP, Goldstein EJ, et al. (2014) Practice guidelines for the diagnosis and management of skin and soft tissue infections: 2014 update by the Infectious Diseases Society of America. Clin Infect Dis 59: e10-e52. Mills AM, Chen EH (2005) Are blood cultures necessary in adults with cellulitis? Ann Emerg Med 45: 548-549. Coburn B, Morris AM, Tomlinson G, Detsky AS (2012) Does this adult patient with suspected bacteraemia require blood cultures? JAMA 308: 502-511. Malone JR, Durica SR, Thompson DM, Bogie A, Naifeh M (2013) Blood cultures in the evaluation of uncomplicated skin and soft tissue infections. Pediatrics 132: 454-459. Paolo WF, Poreda AR, Grant W, Scordino D, Wojcik S (2013) Blood culture results do not affect treatment in complicated cellulitis. J Emerg Med 45: 163-167. Figtree M, Konecny P, Jennings Z, Goh C, Krilis SA, et al. (2010) Risk stratification and outcome of cellulitis admitted to hospital. J Infect 60: 431-439. Ramakrishnan K, Salinas RC, Agudelo Higuita NI (2015) Skin and soft tissue infections. Am Fam Physician 92: 474-483. Trenchs V, Hernandez-Bou S, Bianchi C, Arnan M, Gene A, et al. (2015) Blood cultures are not useful in the evaluation of children with uncomplicated superficial skin and soft tissue infections. Pediatr Infect Dis J 34: 924-927. Perl B, Gottehreh NP, Raveh D, Schlesinger Y, Rudensky B, et al. (1999) Cost-effectiveness of blood cultures for adult patients with cellulitis. Clinical Infectious Diseases 29: 1483-1488. Stamm WE, Norrby SR (2001) Urinary tract infections: disease panorama and challenges. J Infect Dis 183: S1-S4. Czaja CA, Scholes D, Hooton TM, Stamm WE (2007) Population-based epidemiologic analysis of acute pyelonephritis. Clin Infect Dis 45: 273-280. Flores-Mireles AL, Walker JN, Caparon M, Hultgren SJ (2015) Urinary tract infections: Epidemiology, mechanisms of infection and treatment options. Nat Rev Microbiol 13: 269-284. Gupta K, Trautner B (2012) In the clinic. Urinary tract infection. Ann Intern Med 156: ITC3-1-ITC3-15. Gupta K, Hooton TM, Naber KG, Wullt B, Colgan R, et al. (2011) International clinical practice guidelines for the treatment of acute uncomplicated cystitis and pyelonephritis in women: A 2010 update by the Infectious Diseases Society of America and the European Society for microbiology and infectious diseases. Clin Infect Dis 52: e103-e120. Hsu CY, Fang HC, Chou KJ, Chen CL, Lee PT, et al. (2006) The clinical impact of bacteraemia in complicated acute pyelonephritis. Am J Med Sci 332: 175-180. Kim Y, Seo MR, Kim SJ, Kim J, Wie SH, et al. (2017) Usefulness of blood cultures and radiologic imaging studies in the management of patients with community-acquired acute pyelonephritis. Infect Chemother 49: 22-30. Ledochowski S, Abraham PS, Jacob X, Dumitrescu O, Lina G, et al. (2015) Relevance of blood cultures in acute pyelonephritis in a single-center retrospective study. Intern Emerg Med 10: 607-612. Gomi H, Mori R, Laopaiboon M, Usui R, Mori R (2011) Routine blood cultures in the management of pyelonephritis in pregnancy for improving outcomes. Cochrane Datebase Syst Rev 2: CD009216. Colgan R, Williams M (2011) Diagnosis and treatment of acute uncomplicated cystitis. American Family Physician 84: 771-776. Spoorenberg V, Prins JM, Opmeer BC, de Reijke TM, Hulscher ME, et al. (2014) The additional value of blood cultures in patients with complicated urinary tract infections. Clin Microbiol Infect 20: 476-479. Long B, Koyfman A (2016) Best clinical practice: Blood culture utility in the emergency department. J Emerg Med 51: 529-539. Mountain D, Bailey PM, O'Brien D, Jelinek GA (2006) Blood cultures ordered in the adult emergency department are rarely useful. Eur J Emerg Med 13: 76-79. Ehrenstein BP, Jarry T, Linde HJ, Schölmerich J, Glück T (2005) Low rate of clinical consequences derived from results of blood cultures obtained in an internal medicine emergency department. Infection 33: 314-319. Howie N, Gerstenmaier JF, Munro PT (2007) Do peripheral blood cultures taken in the emergency department influence clinical management? Emerg Med J 24: 213-214. Lateef F, FRCS (A&E), MBBS, FAMS (Em Med), Senior Consultant, Department of Emergency Medicine, Singapore General Hospital; Professor, Duke NUS Graduate Medical School, Yong Loo Lin School of Medicine, Singapore. © 2019 Jun KN, et al. This is an open-access article distributed under the terms of the Creative Commons Attribution License, which permits unrestricted use, distribution, and reproduction in any medium, provided the original author and source are credited.